Spring time at Cape Vidal has always been known for the big Couta and Wahoo, that's is you can get on the water between the fresh winds that nail that east coast over this time of the year. Unfortunatley the amount of times it is good over the weekends is virtually zero. This past weekend was some what different and the guys who took the chance got properly luck and nail some great fish. 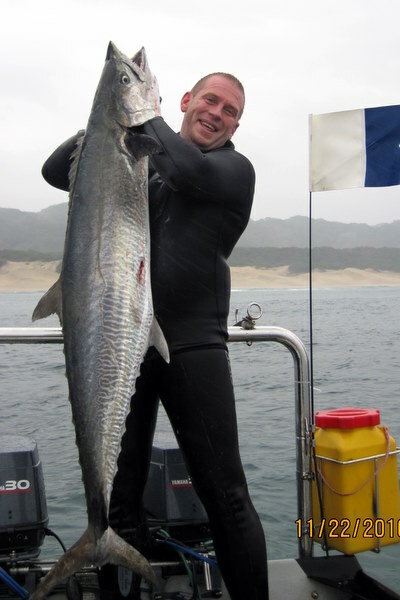 Stefan Pretorius broke his personal best spearing a fantastic 25kg beauty. I am not sure what this weekend holds, but I am sure if the guys can get in and spearfish ...some one will be smiling. This is one of the extras on the spearfishing DVD OneFish that will be released in the next week or so. Onefish Spearfishing Episode 4 - Huge Wahoo and Cubera! 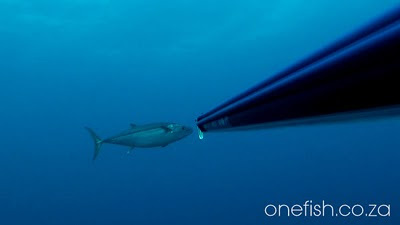 Onefish Spearfishing Episode 3 - World Record Tuna!!! Ryan (Tattoo) & John Van Rooyen Garrick while still on the clock! Waking up the on 22 of October, Friday to a awesome morning meant one thing,one thing only,and that was that I had to shoot some fish.Flat as a lake and with vis 7 out of 10,meant I had to get in the water. With my dive buddy Ryan being at work,I had to phone him and pull a fast one,which he fell for hook,line and sinker.I told him that a mate of mine just got out of the water with 3 snoek and the fish are on like a scone.Within a short time, he was out the office and ready to dive with me. I decided to go and dive off Ballito, at one of my good old favourite spots,near Willard beach.On the way to the spot, I was getting my mate amped up and discussed the power that a Garrick puts up once you spear it,mentioning that a Garrick half the size of a Snoek, is twice as strong and a great fish to land. 20 min in to the dive "wack" Ryan spotted a descent shoal and landed a nice Garrick,a few minutes later I spotted a loaner and "wack" - Garrick home run to John Van Rooyen. I am no pro and far from,but one thing I have learn't is that shooting Garrick is always a work out lol. For some time Braidy has been trying to get a Garrick, but for some reason he has just been unlucky ...over and over. He first took a shot at a Garrick 2 years back, and that was about the best opportunity he has had since. We have seen some fish but they always seem to keep their distance from him. Saturday turned out different tho, we had been in the water for about an hour and I got bored waiting for Garrick so I went off into the white water to look for Brusher. I turned back after a while to see how Braidy was doing on the outside to see his gun unloaded and floating. I swam across to him and as I approached he gave me a big thumbs up. I went down on the fish to see if it needed a second shot. Braidy had planted a perfect shot at the pectorals, so I left him to enjoy landing ...more like wrestling the fish. There were a good couple reports of Garrick up on the coast and I think that this down run will be a good one next month. The past 2 years the Cape Boat and Ski Boat Club has invited spearfisherman to join their annual October Tuna Competition. This year the weather was not all that good but the spearo's did get in on the one day and manage to get a fish. 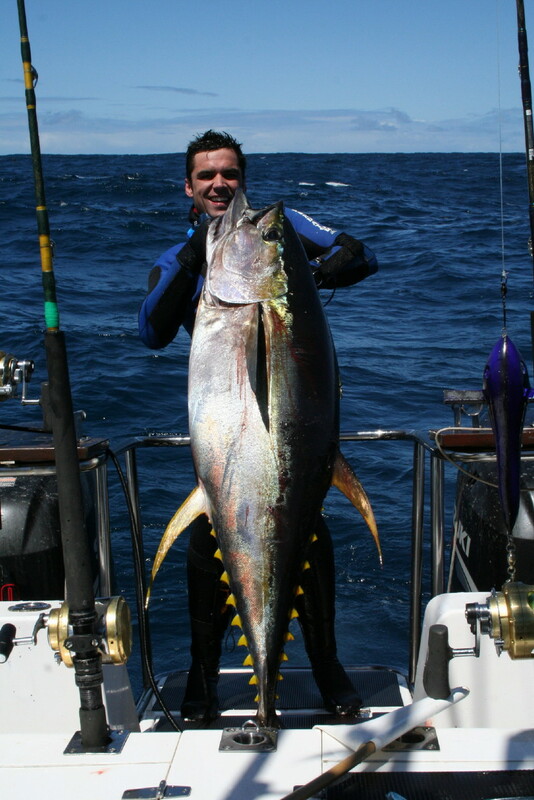 Buddy Johnson landed up with a 63kg Yellowfin Tuna. The vis was apparently not that great, but they did see some other very big tuna as well. 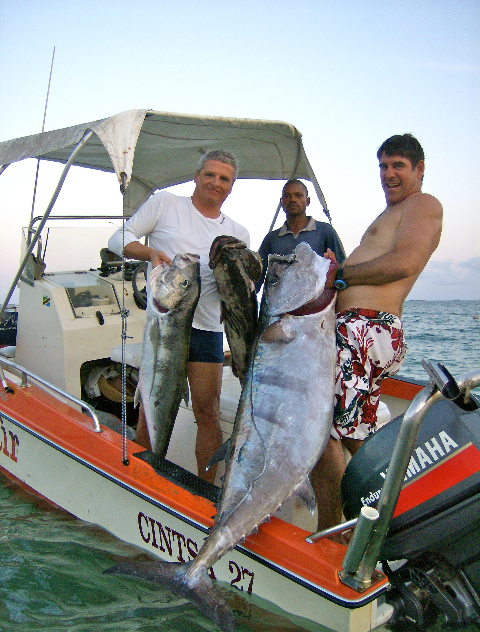 The stories of spearfishing Dog Tooth in Tanzania are numerous, and enticing. Reality kicks home when you constantly get pics from guys like Eric with epic Dog Tooth Tuna that you can only dream of. Here is Eric with a 60kg Doggie that he speared off Kilwa south of Dar es Salaam in Tanzania. This was his second day in an 18 day trip. 16 days spearfishing to go I wonder what he will send me next? Not too much has been happening this past week and weekend. The wind just not stopped. Sunday was looking good, but I did not hear of too many fish coming out. 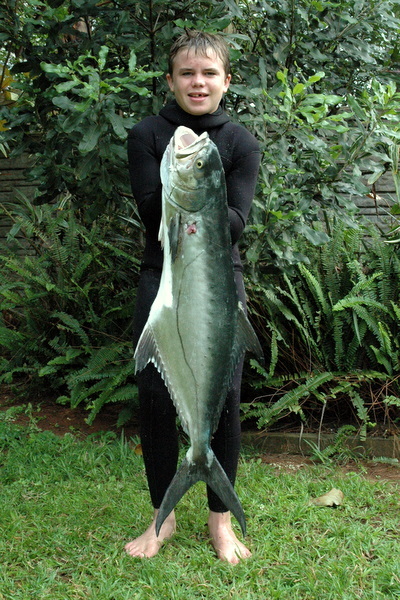 Last week Marcus found a gap in the wind and managed to bag himself a great Daga of 38kg. I think that he will be the envy of most spearo's, myself included! The sea looks mank again for the next few days ..hopefully the next few small southerlies will be good for us. The footage from our spearfishing trip to Madagascar was so epic we did a quick edit and have added it to our next DVD OneFish out in the beginning of November. The spearfishing was so amazing that we are trying to organise to get back to Madagascar early next year. This time a little wiser and hopefully this time we will land some really big Dogtooth Tuna. I am loading some more pics up on the One Fish facebook page so go check it out. Here is something for those Monday blues. If you havent already bought your self a copy of Spearvision ... well then check out some of the action. I have just gotten back from an exploratory spearfishing trip to Madagascar. The Ultimate Spearfishing mag and a journalist from the French magazine Apnea were invited out to Nosy Sakatia by the spearfishing charter Orca Sakatia run by Craig Scott. I dont want to give too much away as we will be doing a full article in the next edition of the mag. But I have to tell you that it is off the hook! We only managed to get out to Castor Banks once as it is 80km out to sea!! But when you get there you will flip your lid. Castor Banks has to be the best place I have ever spearfished ...hands down. On 2 occasions I saw Black Marlin, one was a beast the other was probably about 150kg. We saw Sailfish on numerous occasions and there were Wahoo and Iggies every where. And thats only what you see from the surface!! When you get to 20-25m as you approach the drop off there are Dog Tooth Tuna that swim at you like Salad fish only a 100 times bigger. Dane Salmon happy finally have one Doggie in the hand. The problem with a place like that is that you let fish of a lifetime just swim past, because once you have seen Marlin, Sailfish and 60plus kg Doggies thats all that you will settle for. I pulled back on shots on 30kg plus Ignobilis Kingfish and countless Wahoo. The prize was the Dogtooth, and putting spears into the Doggies was easy, the hard part was landing the fish. I lost and broke 5 spears and rigs, and I was only shooting the Dogtooth tuna I could get the best shots on. Even when you shoot a 40-50kg Dogtooth in the head you get snapped up. 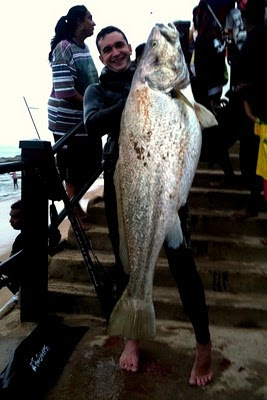 Dane shot what I think was a 60kg fish, I was on the bottom and saw the whole thing. It looked like he spined the fish and it went down doing somersaults, that fish some how still had plenty of life and it bolted off only to snap the metal clip on his line. I think next time I will be whole lot wiser and more prepared...... Like take a whole bunch of spears prepared!